GLACIER sits within EXPRESS Rack 6 in the US Laboratory, Destiny, during Expedition 18. Astronauts no longer need to find fridge space for bothdrinks and experiments, after a sample-filled freezer on the International SpaceStation made its return trip to Earth on the shuttle Discovery last week. The cryogenic freezer can typically maintain atemperature of -160 degrees C (-256 degrees F) and support up to 22 pounds ofresearch samples. And for the first time, it provides serious cooling for suchsamples during trips to and from thespace station. "It has achieved -160 [degrees C] during performancetesting pre flight," said David Ray, a project manager for the GeneralLaboratory Active Cryogenic ISS Experiment Refrigerator (GLACIER) at theUniversity of Alabama at Birmingham. Ray added that GLACIER only needed to maintain -95degrees C (-139 degrees F) for the samples that returned with Discovery, wellwithin the unit's capabilities. Discovery landed Saturday after a 13-day mission thatdelivered new solar wings to the space station. Packed inside its GLACIERfreezer were about 75 vials of blood samples and cell cultures representingsome five months of experiments by astronauts aboard the space station. The first GLACIER freezers launched on space shuttleEndeavour last November, with one ending up installed on the space station andone carrying back biological samples on the shuttle. Astronauts took advantageof their new hardware by repurposing a smaller, older fridge to cooltheir drinks for the first time in eight years on the orbiting lab. Discovery's crew members carried a third GLACIER to thespace station to replace the first freezer, which has now made the trip home. 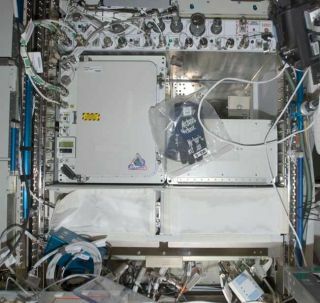 GLACIER joined several other cold storage units, includingthe MinusEighty-degree Laboratory Freezer (MELFI) on the space station and theMicrogravity Experiment Research Locker/Incubator (MERLIN). However, GLACIER came with new features for both thespace shuttle and InternationalSpace Station (ISS), particularly the ability to carry frozen samples backto Earth. The older MELFI refrigerator cannot provide powered cooling on theshuttle's middeck, whereas GLACIER can operate within the middeck sizeconstraints. And the MERLIN fridge can only achieve 4 degrees C (39 degrees F)on the shuttle middeck. "It was difficult to design a payload that wouldmeet the sample requirements for temperature, volume and weight while remainingwithin dimensional envelope of a double middeck locker equivalent," Ray noted. GLACIER is less than two feet long on all sides, whileMELFI stands at a height closer to that of household refrigerators. MERLIN sitsat roughly half the size of GLACIER, but with lesser cooling capacity. GLACIER's design incorporates two insulated door layersto keep its contents cold, with its inner door divided into fourinsulated compartments that provide easy access for astronauts. It can alsooperate in either fridge or freezer modes, with a range of 4 degrees C (39degrees F) all the way down to -185 degrees C (-301 degrees F). Astronauts check GLACIER twice daily when it is riding ona space shuttle, but otherwise Mission Control can keep an eye on how thingsare running by watching telemetry beamed down to Earth. "While aboard the ISS, GLACIER health and statustelemetry is monitored continuously at the [NASA] Huntsville Operations SupportCenter," Ray said. He added that control centers at NASA's Johnson SpaceCenter in Houston and the University of Alabama at Birmingham also keep watch. Such careful monitoring reflects the"priceless" nature of frozen samples from microgravity experimentsthat now have a way to return to Earth, said Julie Robinson, NASA's stationprogram scientist. "Pretty much now every flight we're bringing home alarge number of samples," Robinson told SPACE.com. "Weoften have bins of frozen storage that are coming home and they may have two orthree experiments in one freezer."